Are you looking for a floral or sunflower necklace? Valeria Fine Jewelry can make all kind of floral or sunflower necklace designs. This one had a 5mm Black diamond in the center and 5x3mm pear shaped Citrines. The accents were diamonds. This piece was 1.25 inches tall and wide, so at this size the only stone options besides the pear shapes are diamonds and cz, but with a larger pendant, it would open other stone options up. We can create sunflower necklace up to 3 inches wide or tall in Bronze, Brass, Copper, Sterling or Argentium Silver, white, yellow, or rose Gold, Palladium or Platinum. 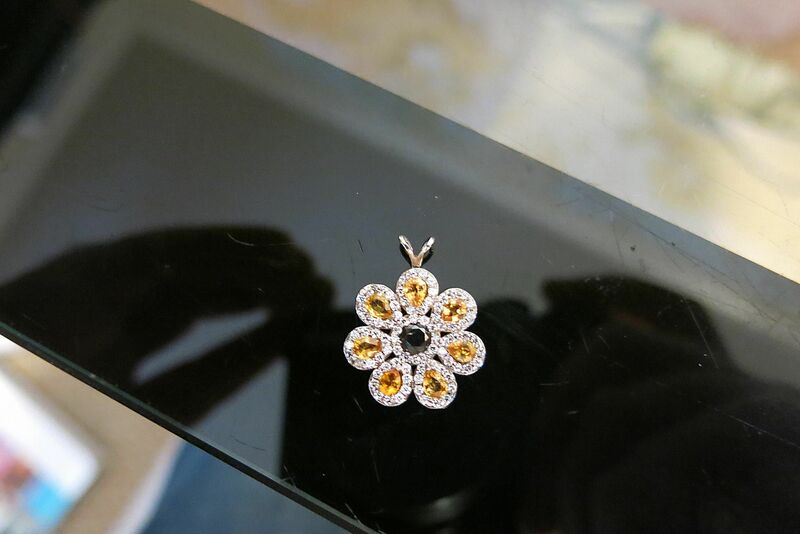 The starting price is for a Sterling Silver sunflower pendant with cz or lab gemstones. Do you love floral jewelry? Click HERE to see another floral design from Valeria Fine Jewelry.